I didn’t know it at the time but James Hake gave the best advice to me when as an art student and I told him I wanted to be a Potter. His advice was simply that you should start off small, making only a small variety of objects, at most five or six. Those objects should be developed to the highest quality you can make before adding more objects to the range. I have to admit I didn’t listen having a whole shop to fill and I was too busy listening to the voices of potential customers, make this make that, no I prefer this colour or that. 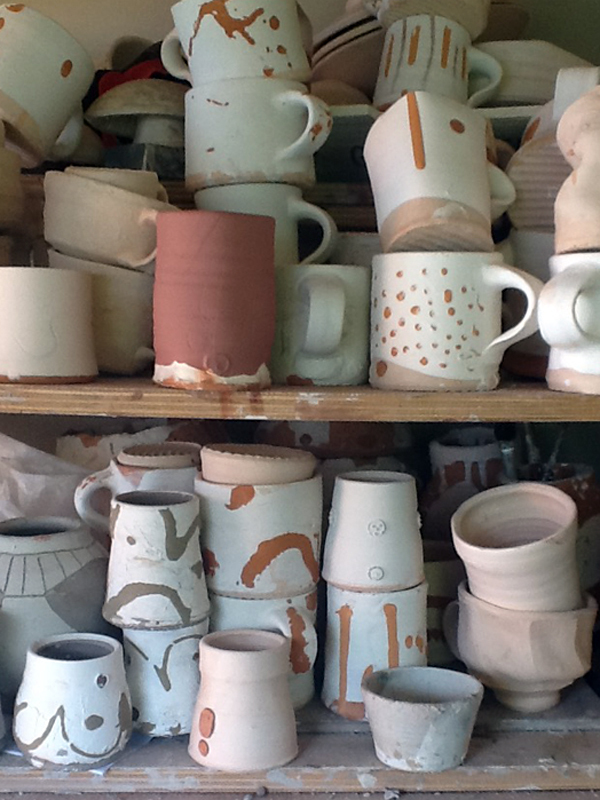 I was quickly overwhelmed in a wide range of lower quality handmade objects, and the simple advice was drowned out. The major take away from my interview with David Worsley from Dove Street Pottery was that he was so good at making high quality objects so quickly, because he had focused on his forms, just concentrating on these same few shapes, with set weights. His focus is so impressive; I really admire it, because it is so easy to change things completely from making session to making session. This last year I have been amazed by the new forms that appear from time to time, they just speak of his skill. So when I started on Meerkat and I felt rusty at throwing in front of people, at first I did my usual of flitting between things. I then sat down and decided I would have to focus my energy, like these two potters suggested. So I decided I wanted to make some mugs for the writing matters group so decided to just focus on this one thing. My handles have always been a sore point for me, I look at the handles of Tony Clennell, Jeremy Steward and Carter Gillies with pure envy, their handles don’t seem to make sense to me, I can’t impose my will on the clay in the same way. Regardless of not knowing how to make handles like these, I settled into making mugs and handles. 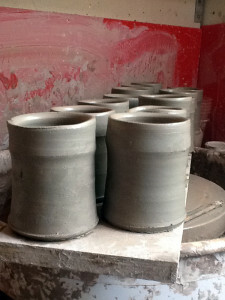 I have pulled handles off of plant pots buckets jugs anything that is around or outside my workshop. I feel more confident in making mugs and the handles that go on there but I still have a long way to go to really understand them. To anyone that wants to get really good at any form of making, I think this is the best advice to have this very narrow purposeful focus. I am not saying to make the exact same object over and over again but aim for the object to feel part of the same family like siblings look alike but are not necessarily twins. Yes it will be boring at first, but this is a chance to forget ego, in my experience being a maker is not about the ego. A family of flower vases. There are ways to ensure accuracy for simple forms if you throw to a simple measure that created from a chopstick attached to the wheel tray which will measure the final height and width. This is the lowest tech way and in combination with a calliper measurement for the foot would be the fastest. A better mark can be constructed that swings out of the way until the final refinements of the shape. My favourite idea is having a profile though especially for more complicated forms, cardboard profiles are easy to make and held up and the form can be quickly checked. If you are thinking like a production thrower of Stoke on Trent they had a rib for each form, there is an interesting post on slate ribs Slate Tools. Making these sorts of ribs is a bit more of an investment of time and energy but worth it if you are planning on being focused with a form to the point of accuracy and want to aim for speed too. One aspect I never considered before interviewing Joe Hartley was that you could also use the size of the throwing batt to indicate the size of the piece. This is because you know how it relates against a batt that is almost the same size as the pot. This means for smaller piece you can leave them on the batt because there is negligible difference between the size of the foot and the batt so won’t take up much more additional space. Also Adam Field recommended remembering how many moves it took to make an object. To follow those moves exactly, down to the amount of pulls, and passes at forming. IF your hands know what they are doing before they do it, they will be focused like your mind. 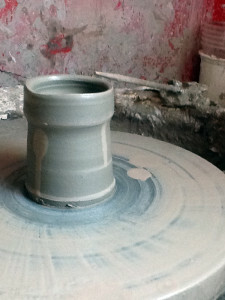 So try it out, working with clay doesn’t necessarily encourage this narrow I can recommend it. I think it is necessary, though I don’t think you need to be accurate to the highest degree isn’t necessarily what it is about but using simple tools to help objects feel closer to being a family. Know what you are doing before you throw that clay on the wheel, so that you aren’t randomly creating on the wheel with no focus. This entry was posted in Making, Meerkat and tagged Adam Field, Carter Gillies, ceramics, clay, Dove Street Pottery, handles, hands on thinking, James Hake, Jeremy Steward, learning, making, meerkat, mugs, pottery, Research, Tony Clennell, tools. Bookmark the permalink.